Premier League match preview. 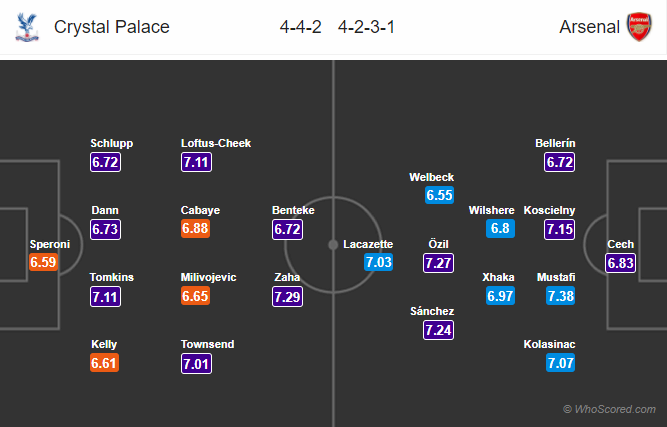 Lineups, News, Stats – Crystal Palace vs Arsenal. Referee appointments, kickoff. Matchweek 20. Crystal Palace will host Arsenal in the 20th match week of the English Premier League this Thursday at Selhurst Park. The home side will welcome Christian Benteke as he returns from suspension, he will be taking the front role in the starting eleven. Boss Roy Hodgson has five players on the sidelines through injury, including Mamadou Sakho and Connor Wickham. Shkodran Mustafi returned from injury last week and featured from the bench against Liverpool. He is likely to take a starting role this time. Sead Kolasinac likely to return at the left-back role. Arsene Wenger could be making changes to the lineup, Danny Welbeck likely to replace Alex Iwobi after his poor display against the Reds. Olivier Giroud remains out through injury. Crystal Palace are unbeaten in their last 8 games in Premier League. Arsenal have won 3 of their last 4 away games against Crystal Palace in Premier League. Arsenal have drawn 3 of their last 4 games in Premier League. Crystal Palace have won 2 of their last 3 games in Premier League. Crystal Palace 1 – 1 Arsenal, Alexis Sanchez to score equalizer for the visitors in the final quarter of the game.